The smallest and lightest jack on the market is ideal for shallow water skiffs and flats boats. It has a footprint of only 14-5/8" W x 11-1/2" H with a weight of only 23lbs. 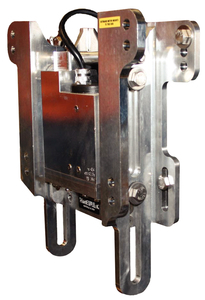 The strong, self contained actuator takes only 8 seconds to go from top to bottom and has 5" of travel. 3 mounting hole options on the transom side and 2 on the engine side. Optional adapter available to accommodate clamp-on outboard motors. Up to 90 HP.